Maybe you’re thinking of redesigning your kitchen and upgrading your current appliances. Or maybe your range is many years old and is starting to give you trouble. How about converting from electric to gas, and taking advantage of the many things you can do with gas appliances? Electric ranges are built for convenience. They are a plug and cook appliance that is easy to turn on (no ignition system) and provides no hazard of live flames shooting up from the burner. 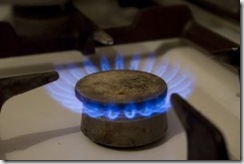 For many people, gas is the preferred method for cooking. Gas gives you a much finer control over temperature, and makes it easy to move pots and pans from one burner to the next without waiting for them to heat up. They heat up quicker, cool faster, and allow you to cook even when you incur a power outage. If you’ve always had electric and are considering a move to gas, it is necessary to make some modifications to your kitchen area. Because your range may not be near the gas line, the first thing you’ll have to do is locate the gas line, and lay pipe to the range area. Working with your local plumbing contractor can ensure pipes are laid and connected correctly, avoiding serious problems with leaking gas lines in the future. This is not an easy do-it-yourself project. Because of the serious ramifications of working with gas, make sure you rely on an experienced plumber who understands and has worked with laying and working with gas lines in the past.